Howard Greenberg Gallery is pleased to announce an exhibition of new work completed in 2002 and 2003 by Eikoh Hosoe, one of Japan’s preeminent twentieth-century photographers. 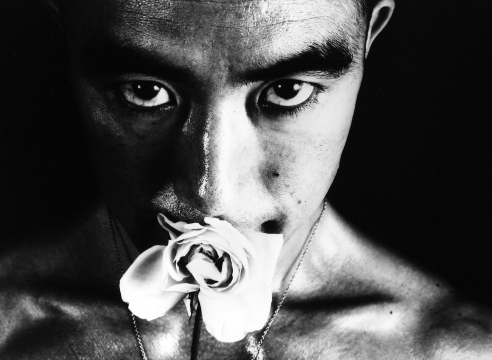 During the postwar era, Eikoh Hosoe played a key role in the creation of new graphic style that emerged as a reaction against the realist documentary tradition prevalent in Japanese photography at the time. Hosoe’s landmark series include Man and Woman, 1959, Ordeal by Roses (1961-1962), Kamaitachi (1965-1968), and Embrace, 1971. These series demonstrate the rich and diverse style of Hosoe’s photography in combining an extremely personal view with radical narrative commentary on sexuality, culture, mortality, and memory. Hosoe set forth “Iconoclasm-by- Photography” a creative theory that placed him at the forefront of the development of a modern Japanese photographic aesthetic.